Marking their first bibshort entry in the women's s7 line, the T.Laalalai bibshort from Assos delivers the same high-performance pioneered in the men's s7 line but now refined specifically for the female anatomy. Starting at the top, these bibs feature the ergonomically-optimized Y7 strap design, providing more relief over the throat and chest for better support regardless of your position on the bike. These straps also include a clever magnetic buckle to quickly get in or out during rest stops. Constructed from the same type.439 material thats used in the men's T.equipe and T.cento shorts, the shorts provide an outstanding blend of moisture wicking and quick drying properties for otherworldly temperature regulation. The standout feature of the type.439 fabric is its compressive nature, promoting circulation to aid in recovery while simultaneously shielding your muscles from the fatiguing effects of micro-oscillations and road vibrations. Of course, these bibs also feature a targeted Advanced Ergonomic Pattern Designo support your body once in the riding position. These shorts feature the new amethyst S7 Lady chamois featuring goldenGate technology. Attached only at the front and rear of the short, the multi-density memoryFoam insert is free to move with your body while you pedal, serving to "fill the gaps" that occur during your pedal stroke. Good bib overall. The chami is very comfortable. I do find the shoulder straps a little uncomfortable as it might be too short for my body. A larger size would however be too big. I only notice this on really long 3-4h rides. This may be due to my longer torso lengrh. I own bibs from almost every company out there and these are by far the very best I have ever worn. The quality and comfort is exceptional. You will not regret buying these. 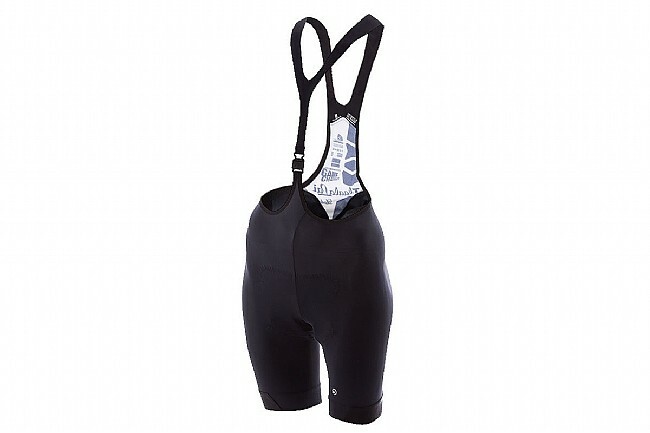 The pad in these bibs is the same as the pad in the similar shorts and it is fantastic. Works as advertised, the pad is only tacked to the outer material in a few places and allows the friction to between the pad and the lycra, not your skin and the pad. The shoulder strap material is very comfortable, no seams and no chafing. attachment is simple and easy. I bought a 2nd pair!